Côté, Jean G.. "Jean-Léon Côté". The Canadian Encyclopedia, 15 December 2013, Historica Canada. https://www.thecanadianencyclopedia.ca/en/article/jean-leon-cote. Accessed 23 April 2019. Jean-Léon Côté, surveyor, legislator (b at Les Éboulements, Qué 26 May 1867; d there 24 Sept 1924). After studies at Montmagny and Ottawa, Côté became a land surveyor with the Department of the Interior in 1890; he settled in Edmonton in 1903. Jean-Léon Côté, surveyor, legislator (b at Les Éboulements, Qué 26 May 1867; d there 24 Sept 1924). 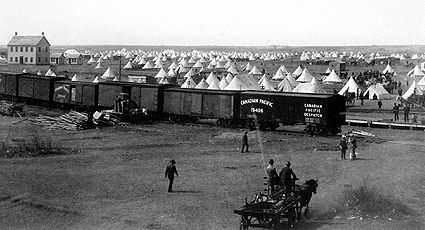 After studies at Montmagny and Ottawa, Côté became a land surveyor with the Department of the Interior in 1890; he settled in Edmonton in 1903. Between 1893 and 1895 he was on the ALASKA BOUNDARY COMMISSION doing the preliminary survey (completed after WWI). Mount Côté, near Ketchikan, Alaska, was named after him. In Dawson, Yukon Territory, during the KLONDIKE GOLD RUSH, he was associated with the Cautley Bros.
Elected MLA for Athabasca/Grouard in 1909, his interests focused on Alberta's natural resources, including the McMurray tar sands. Côté was appointed to the provincial Cabinet in 1918 as provincial secretary, eventually becoming minister of mines and minister of railways and telephones. In 1919 he was instrumental in the establishment of what became the ALBERTA RESEARCH COUNCIL. Named to the federal Senate in mid-1923, he succumbed to an attack of peritonitis in 1924.